Much of the inspiration of this project arose from the large amounts of aluminum can projects that are out there. A simple google search on the aluminum can art provided many sources of ideas and inspiration. 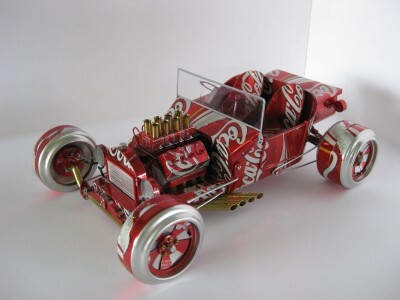 People have made cars, animals, flowers, furniture, and many more from simply using aluminum cans. For this specific project, however, I chose the flower because it was not only aesthetically pleasing and cute, but the skill level involved seemed appropriate for me as a beginner. Attached below are a couple images that I drew inspiration from. Within every landfill or trash can, there is always an abundance of cans that are lying around. These cans are seen as nothing more than a nuisance and a symbol of garbage. The aesthetic in this project is based primarily off of this idea. It is the act of creating beauty and art through these meaningless aluminum cans that are otherwise seen as trash. Furthermore, the abundance of designs and colors that exist on these cans allow for many creative projects. The smooth silver finish on the inside provides an aesthetic on its own as well. The design process that I followed was pretty generic for this project. 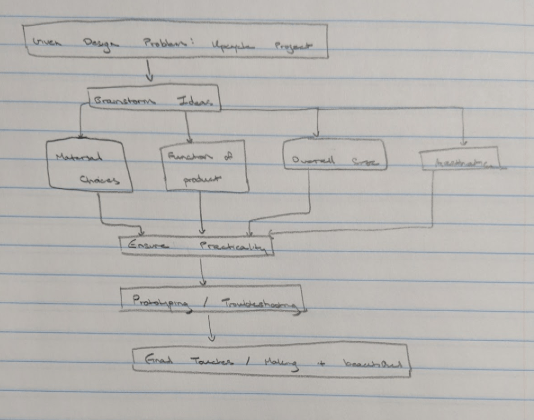 It began with me looking at the problem statement and then brainstorming ideas. This thinking process involved studying what type of materials to use, how large the object will be, what kind of aesthetic I wished to apply, and of the functionality of the project. Moving on, I began thinking about the practicality of the project. This was basically a sanity check to make sure what I was planning on making was not only possible but within my budget. Next, I moved on to the prototyping and troubleshooting phase where I began constructing the project and when certain problems arose I would find solutions to them on the spot. This was actually the most difficult part of the project because cutting the aluminum cans into a specific shape turned out to be much harder than I thought. Finally, the last step was to put on finishing touches and making the project look beautiful in general. The image below shows the complete flowchart that I used. The construction of this aluminum can was relatively easy despite the sharp edges of the aluminum and the difficult cuts that I had to make. The first step was to simply draw and cut out a petal template using paper. Next, was to cut off the top and bottom of the soda cans and flatten out the aluminum. Once flattened, the petal template was placed on the aluminum and the cutting began. I cut out a total of four petal layers using a Fanta and a Xing Tea can. Next, I cut off parts of a hanger to be the stem and placed all four layers of petals on to it. Finally, because the petals started to fall down I bent the top of the rod and used a rubber band to secure it from the bottom. The images below show my construction steps. Above you can see the final product where all four petal layers were stacked on the hanger rod and the rubber band is holding them in place. In terms of future improvements, I would like to create more flowers and use them to fill a small vase. I think that a bouquet of these metal flowers will be beautiful and unique. Another idea that I would like to implement is to use a variety of different sodas to obtain a more diverse range of colors. Finally, one last idea that I would like to implement is to use certain green cans and cut out leaves that I could hang off the stem. The color works great with the form. The flower seems friendly, with the rounded petals. Is it actually sharp edged? Can you describe the aesthetic a bit more? It seems to fit with yard or landscape art; a bit kitschy. I like the use of aluminum cans because they truly are abundant in waste! Using them to make a flower is perfect given all the different colors of cans! Good job. I like that you really focused on the aesthetic and not necessarily the function. This turned out beautiful, maybe you can make a bouquet of aluminum flowers! Evan, I like how you made something beautiful out what most people consider trash. It was very artistic and I like how you can just use the colors of the can instead of painting it something else. It gives its own kind of aesthetic. I really enjoyed the concept of using multiple different soda cans for different accent colors, and I think your project turned out really well. If you choose to further develop this idea, I believe it would be interesting to experiment with different and/or more complicated flower shapes, much like the one shown in your presentation as an example. I like how simple and creative is your design. I totally agree that soda cans are everywhere, and upcycling those is a really good idea. I enjoyed the artistry in this project. It’s very pretty and the cans you chose have colors that compliment each other well. Really like the color choice for the cans. Looks very vibrant! Maybe use a tack of solder or hot glue on the back to keep it from falling down instead of the rubber band. Could also add smaller pedals to the inside to make it look fuller.